Unique, luxurious, private and peaceful … Villa Jivana Ananda is a superb illustration of a private villa managed with such expertise that it exudes all of the convenience of a six star hotel. Beach holidays are at their best when, at the end of a long, sandy and salty day, you can shower, refresh and enjoy a long cool drink and a divine meal prepared by the chef. At Villa Ananda, our days were filled with swims in the ocean, searching for shells in the rock pools, enjoying fabulous Thai cuisine and relaxing in style. It is the perfect choice for families or friends. The villa is safe and practical for children – ours had an absolute ball here - yet sufficiently private and certainly spacious enough to give everyone ample room to themselves. Ananda has to be one of the best villas we have seen in Asia. Note this villa does not permit weddings or large functions. If this is something you are interested in look at its sister, Villa Shanti. As a beach escape, Villa Jivana Jia takes a lot of beating. Its location is excellent as is the long list of in-villa facilities and the accompanying service. We liked the five-star-hotel-style greeting, with cold towels and welcome drinks – this place lifts service levels to a very high standard. The villa menu is extensive and lovers of Thai food will not be disappointed with either the taste or presentation of the dishes - Western choices are also available. There’s also a good wine list but for some choices you may need to order a day in advance. The remoteness of the villa means that those wanting to see the sights of Phuket will have to organise a car and might spend some time in it. On our short visit we didn’t leave the property except to walk along the beach, but for longer stays a rental car is a must. The villa is well equipped for any weather conditions with books, board games and TVs for wet weather, and bikes, kayaks and the wonderful pool for when the sun is shining. 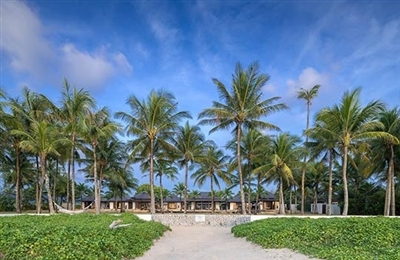 Villa Jia’s position, right on the edge of a beautiful deserted beach, definitely sets it above most of the competition. 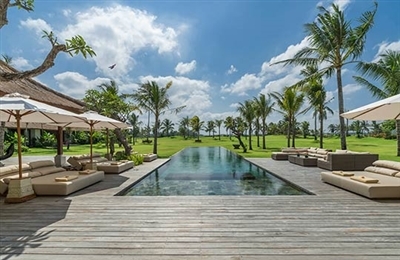 Villa Jivana Shanti is a fabulous place for a stylish beach escape or for hosting a party or special event. It’s easy to see why it’s a popular wedding venue: the vast lawns and the ocean-front setting is fantastic and very photogenic! The size of the garden also makes Villa Shanti ideal for families with energetic youngsters in tow. Natai is a great swimming beach with very little swell or currents, and you literally have the place to yourself. The owners have purposefully kept the villa simple, stylish and low-tech: this villa is geared more towards enjoyment of the natural surroundings, reading a good book or evenings filled with lively conversation. The villa menu is extensive and lovers of Thai food will not be disappointed in the taste or presentation of the dishes prepared - Western choices are also available. There’s also a good wine list but for some choices you may need to order a day in advance. The rooms are comfortable and we loved the greenery in the bathrooms and the property’s resident wildlife, including a squirrel, a displaced crab, a pair of boisterous frogs and a very shiny black cat. With the surrounding natural beauty and soundtrack of bird song and gentle breaking waves, Villa Shanti is a good choice for those searching for a peaceful retreat. We’ve been lucky enough to visit a lot of beautiful villas in our time, but Kaba Kaba Estate exceeded all expectations of comfort, luxuriousness, good taste and space. There’s so much to do on the estate itself that its out-of-town location is not an issue. Everything has been thought of, from tennis, foosball, air hockey and all the major electronic game consoles, through to a library, gym and even a croquet lawn. If only we’d had more time! As it was, the pools, the spa and the spectacular home cinema were more than enough to relax and entertain us. The staff were just the right mix of professional and friendly, and the chef is a consummate pro, delighting us with everything he presented. Although there is a selection menu, we highly suggest that you just ‘go blind’ (like we did) and let the chef and his team surprise you with their magic. Our simple, three-course Balinese dinner was off-the-charts delicious. Do go for an early morning wander through the rice fields. The locals are very friendly and the experience will be something the regular tour guides can’t give you. The wide-open spaces are awe inspiring.